Features graceful, yet simple lines, and the folding sides make it a versatile space saver. Measures 14-1/2"H. Hinged sides open to a 29" x 36" surface. 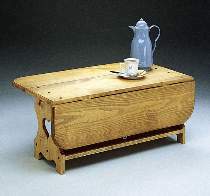 8878 Hardware Package includes 2 drop leaf supports, 44 screws, 4 hinges and 12 screw hole buttons.